98 little gemstones later and the Wraithknight is painted! The spirit stone on the back was picked out in green, and based on some feedback regarding the metal I had used on the joints I went back and re-did those sections in bone, which I think works out better overall. Then it was dozens and dozens of gemstones. Oof. I went back and made the same joint color update to the Wraithlord and snapped a quick pic of 'em for scale. Overall the Wraithknight was an absolute blast to build and paint! I'm definitely scheming on building another one - though next time around I'm thinking it'll have the scattershield and magnetized wraithglaive or suncannon arm (as well as magnetized shoulder mount weapons). That'll have to wait for a while though - with GenCon rapidly approaching I gotta save my pennies! Very nice result. Really like the scheme and the pose is very dynamic. He definately needs a friend though, think how great two of them would look on the battlefield. You have done a fabulous job with tis. The pose is so dynamic and the paint job is great. Really like how it turned out. Beautiful model, great posing, and fantastic paintjob. I love the blue paint job! A truly superb result, well done! Very nice. There is a lot of subtle stuff going on there. @Rictus: Thanks man! Aye, there's definitely another one coming at some point! @Musings of s Smurf: It was a blast, I'm really happy with how the Alaitoc scheme worked out! @Zab: It was really fun messing around with the sponge and wash techniques, definitely going to be doing some more experimenting! That looks excellent! So many gem stones! They look really nice, it was worth the effort I think. The banners would be pretty rad; I always sort of associated Eldar titans having them. It certainly might be challenging to do effectively (and durably). Good luck if you try though! I;m not sure which is more amazing, the paint job, or the speed at which the amazing paint job was done! That is a fantastic result. Far better looking than the studio red. And so HUGE..... A shot of him next to one of the mech-knights would be much appreciated? Looking spectacular mate, and the scale shot is truly impressive. Eldar was one of my first armies, and I'm finding it hard to resist a new army with all the excellent models people like you are producing. @Godyn Fischig: Indeed - there were a zillion of 'em! I worked up some test banners yesterday, hope to have some working versions soon! @Da Masta Cheef: Thanks mate! I had a fair bit of free time over the weekend, and I was surprised at how quick it painted up! @Dai: I appreciate it! I'll snap some shots of the knights facing off soon! @Sheep: It's definitely a big model, but I think it ties in to the Eldar aesthetic rather well - I'd love to see what you'd do with one! Very cool man .. When I finish up the Crimson Hunters I think I'm going to start building my WK up. Seeing all the cool poses people are coming up with is making me want to paint mine up! I really like the pose. Hopefully more people will attempt dynamic poses. Everyone I see is standing at attention. @Todd Sherman: Nice! I really want to see what you do with a Wraithknight! @TheAmbit: It took a little elbow grease, but the model does have some great potential for dynamic poses! great job as usual my friend! Great job on the model. Kudos to you. Excellent work on the large spirit stones. As you said in previous posts. You'll have the space to do gradient work on them. That you have and they look sharp. @JHaygood: Thanks Jay! I appreciate it! @a Sent One: Cheers mate! I really enjoyed how yours turned out as well, I loved the gradient work on the blue sky to night stars. That was epic! Oh man, all those spirit stones. Congratulations that must have taken forever! @Cornumortem: Indeed - all the little gems took as long as the blue and bone put together! Thanks! I step away from the computer for a couple of days and you go like a mad man and knock out a ton of posts! The Knight came up smashingly - that first picture tells it all - brilliant work mate. I also love the last shot with the little brother. Fantastic work mate - well done. Ya know, I just shrugged off the Wraithknight as a way too big cash cow for GW and didn't really care for what i saw -- you you've done an awesome job and really made him look badass! 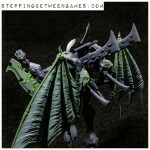 Love the pose, the wriathbone weapons and the color scheme. Nice work! @J.D. Brink: I appreciate it! I'm a big fan of the old Epic Knights, so it was a must have for me - after all I've been doing some Imperial Knights, so they needed at least one opponent!